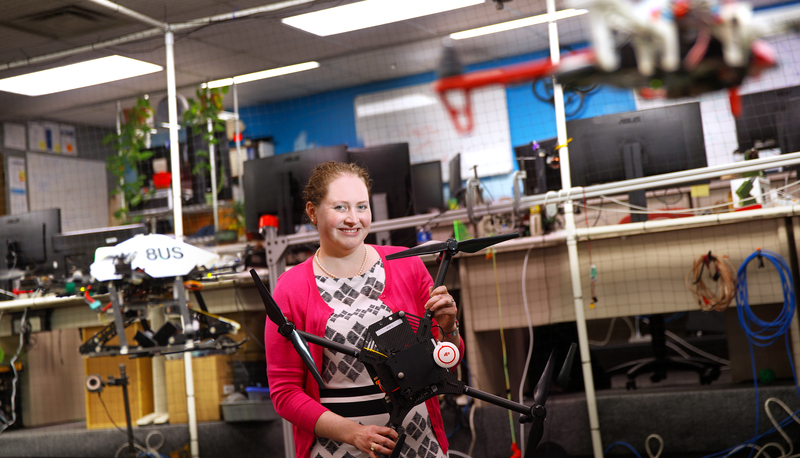 Brittany Duncan, assistant professor of computer science and engineering at Nebraska, has earned a nearly $550,000 Faculty Early Career Development Program award from the National Science Foundation to develop software that allows drones to communicate through movement and maintain comfortable distances from people. Every day, drone sightings are becoming more common — buzzing around the local park or hovering above the kids' soccer game. But many people are apprehensive around drones, citing privacy and safety concerns. University of Nebraska–Lincoln computer scientist Brittany Duncan wants to ease people's discomfort by enabling drones to communicate with the humans around them. Communication could also make drones valuable coworkers in numerous settings, such as warehouses, agricultural fields or even nursing homes. First, she and her team will conduct surveys to understand what people want drones to communicate — perhaps, for example, when the drone is in photo-taking mode. Next, they'll identify drone movements that people intuitively understand. For example, Duncan's previous work found most people understand that a drone circling in a tightening downward spiral indicates that it's landing. Duncan's award also allows her to educate the public about drones. She’ll host a six-week class on robotics and human-robot interaction with the university's Osher Lifelong Learning Institute. She'll also work with University of Nebraska State Museum staff to teach middle school students about robotics and how to conduct robotic experiments. The students will use those skills to teach even younger students.